Your humble bloggist has a dirty secret which must be shared with the world. Outwith the realms of e-wittering, I'm a salesman. Hundreds of books and seminars have covered the topics of selling - how to grab your audience's attention, how to push them to buy, how to press their buttons that will make them part with their cash. 1. Place Mrs Mugwump in a situation she understands. (Chopping veggies in the kitchen - make sure Tarkwin gets his five-a-day!). 2. Slap her repeatedly in the face with mangled science and occultic statistics. 3. Frighten the bejesus/be-allah/be-vishnu out of her. 4. Introduce your product as the saviour (non-denominational) of this oh-so-rational fear. Two modifiers (can & some - a far cry from 'will' and 'all') and two "surrogate end points" of sorts (symptoms - may not have anything to do with having the cancer, and in any case the symptoms are only similar - pain in the hips/pelvis and lower back pain to name two. I reckon these are the least of my pains after 25km of muck, stones, hills etc). I use the above as an example, and not as proper investigation as to whether heavy-duty multi-terrain mountain biking gives you 'issues'. The real thrust of this blog comes from our great Sentinels of Selling, the Advertising Standards Authority. Every week, they publish on the web every complaint that has been made about an advert, and whether or not the complaint is upheld - generally makes for interesting reading, not least to see the crazy things people complain about. "Fact, your chopping board harbours 50 times more bacteria than your toilet seat. But Dettol Surface Cleanser kills 99.9% of bacteria, including MRSA, E.Coli, salmonella and even the flu virus ..."
Now, apart from anything else, I don't count the flu virus as being alive therefore I don't have any truck with products that claim to kill it, but that's a personal thing. Also, they didn't even have the decency to class the bacteria as 'good' or 'bad' - a distinction they were keen to keep to themselves. Anyway, the ASA asked parent company Reckitt Benckiser to prove this 'fact'. As it happens, it turns out the 'fact' was derived from taking samples at 5 houses in Hertfordshire (all with kids under 3 years old) and the ASA in their good wisdom reckoned this wasn't representative of the nation. Complaint upheld. 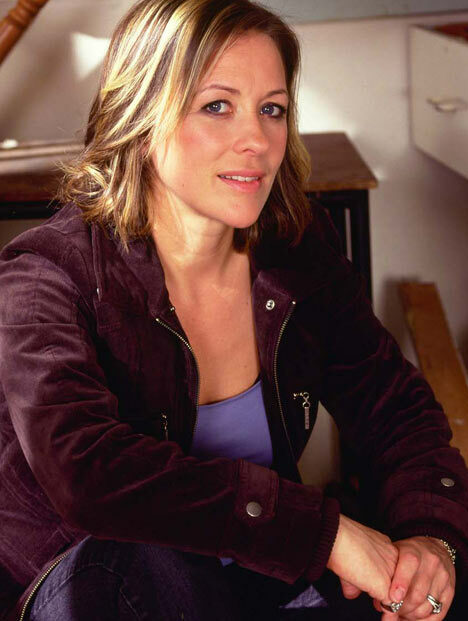 Next we get the 'playing with words' - US or UK, harbours/harbors indicates a long term holding - harbouring anger against Sarah Beeny for talking rubbish about chemicals, for example. The ASA also felt that by using the word 'harbour' RB were inferring that these chopping boards were crawling with all this bacteria after being washed by a normal person in a normal way. The evidence produced by RB indicated (as most people know) that rubbing a couple of chicken breasts on a chopping board before using it to wipe your arse produces a surface which may be "unsafe for food preparation". What they didn't provide evidence for was that if you wash it in the normal way, you'd be surprised how clean it becomes, that is without using an antimicrobial. And therein lies the rub. The Dettol product didn't claim to clean better than other products, it just claimed to clean, but pressed the fear buttons of MRSA, E.Coli and salmonella. "Fact - your chopping board harbours some bacteria. But don't worry, they won't do you any harm if you've washed it in the normal way after it was last used. If you do have an irrational fear of things you can't see/understand and want to live in an artificial, sterile, (in)sanitary bubble, then using **branded** Multisurface Cleaner will kill things like MRSA, E.Coli and salmonella, even when they're not there. Do remember, that the moment you touch your nose, a lot of your work will have been in vain. There are further fun and games from the ASA website regarding all the upheld complaints about the highly dubious York Allergy Tests by YorkTest Laboratories. Not surprisingly, everyone's favourite pill peddler Patrick Holford is a fan - read the outcome on HolfordWatch. No real scientist would doubt any of the facts, they stand to reason and are everyday occurances. 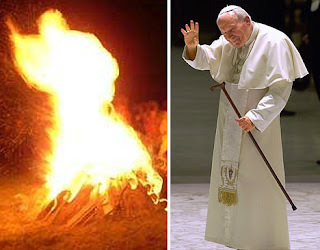 However, when El Papa JP2 (think less John Prescott, more John Paul) appears in a fire in Poland for some reason people are sceptical. The Daily Mail ran the story here giving further proof (if any were needed) for Dr* T's First Theory. Here is the photo from this truly momentous event. It's clearly obvious that it is the Pope and indeed, his followers seem to agree. 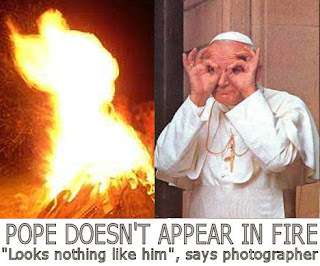 The Daily Mail, known for its responsible journalism and level-headedness, reported the head of the Vatican TV station Father Cielecki saying he was convinced the picture showed the former pontiff. "I was so happy with the picture that I showed it to our local bishop who said that Pope John Paul had made many pilgrimages during his life and he was still making them in death." Really. Now of course, we learn a lot from the afterlife here - the pope still has his back problems. A bit rubbish for a place of eternal happiness if you ask me. But before I drift off on a diatribe of what is actually light-hearted journalism poking fun at people's religious fervour, it should be said that there are people who think it's him. Actually him. Here for a brief second at the right angle to say ... well, nothing, but it was him. When you realise there are people who believe anything as fervently as this, despite 99.9999% of the population having a giggle, it really brings it home that some people will believe absolutely anything, regardless of how ridiculous it is. I promised myself I wouldn't mention homeopathy in this post, but I've just failed. Be shamed, Society of Homeopaths. I know I'm a bit behind the game on this one but it's an important topic and cuts right to the core of what adventures in science are all about. The most wonderfully sensible, intelligent, and possibly attractive blogging duck that I am aware of (le Canard Noir) has been threatened with legal action by the Society of Homeopaths for an article he blogged last August on the follow up to the Sense About Science sting on dodgy homeopathy/sugar-pill salespeople, selling sugar pills to people on the pretence/misguided belief they would be prophylactic to malaria. So rather than speaking to Mr Duck themselves, they decided to threaten the web-page host with legal action, who in turn shat their lilly-livered y-fronts and had the page removed from their servers. One of the most revered bloggers in scientific academe David Colquhoun, is keeping the story alive and updated on his blog, DC's Improbable Science, as he has also been bullied and threatened for a similar thing. OH MY GAWD ! Chemicals? Are you sure? I don't like to brag on my blog, it just sometimes happens to be inevitable. EDIT (14/10/07): ValueAddedWater has kindly put a .doc version of the Daily Mail's article here. Now you can read at your leisure - is your make-up killing you? The answer is indeed no. Let's not forget, that this is nothing more than a press release for a TV show. At the risk of treating the Daily Mail with any sort of seriousness, I couldn't let the article slip away unnoticed without drawing out a few salient points. Last year, Britons spent £6.4billion on cosmetics and grooming products, with the average woman applying 12 toiletries every day. But here's the rub - these toiletries can bring with them at least 175 chemical compounds. Of course, the manufacturers would say these chemicals and resulting products are safe, but a growing school of thought begs to differ. I think this gets to the nub of why this sort of program/article has me screaming like someone possessed (with what, I don't know) - where is the balance? Where is the person saying "Actually, what you're talking about is invented, manipulative, fear-inducing rubbish." They were then challenged to live without their beauty products for eight days, swopping everything for natural chemical-free varieties. Hmmmmm..... what would they be, then? No chemicals. Water? Nope, it's got a Safety Data Sheet, so must be a chemical. Air? Surely even the Daily Mail wouldn't allow us to say that oxygen, nitrogen, carbon dioxide et al aren't chemicals. One thing is for sure: few of us would want to rub any of these chemicals into our eyes, far less ingest them in liquids by drinking them. "Man-made chemicals first emerged 100years ago, and every decade since, the overall production of these synthetic chemicals has doubled. 100 years ago? 1907? How about ...ooohh....so may to choose from.....Alfred Nobel's dynamite company (set up in 1860)? (allow to me kindly ignore thousands of years of "making chemicals"). Both girls use a natural deodorant, which contains no chemicals. For the love of sweet baby Jesus/Aphrodite/Thor/Ra, what the hell does this mean? Look around the eyes. Don't look at the eyes, look around the eyes. No make up? At all? Let me ask you, is this the face of someone who hasn't used make-up for two years? Allow me to reinvoke Dr* T's first theory. So where were we? Oh yes, I was wittering about people's anti-scientific attitude and how, due to all the hard-to-understandness that comes with sciencey things people are choosing in their droves (sheep analogy might be better) to believe something much more understandable and appealing to their uncritical personalities, but which are fundamentally, incorrect. Acupunture is a bit of a classic. It's got needles, history (the chinese were apparently using it 14 billion years ago), drama, excitement, mysticism, religiousity and theatre all rolled up into one non-offensive therapy. The question, as always, is does it show any benefit over placebo?. Well, that depends not on the results but on the newspaper you read. A well-documented story in the paper last week (covered by Ben Goldacre in his excellent Bad Science column in the Saturday Guardian) gave details of research that suggested that acupuncture was better than no acupuncture, but no better than random pin insertion. I'm not going to cover it here - the full dialogue on the Bad Science website is well worth the read. Despite being 30 years old, both my hips are crumbling as we speak due to osteoarthritis. Bummer. Nothing outside very invasive surgery will do anything for it - science fact. That doesn't stop everyone telling you that chondroitin will re-hipify you or that without glucosamine you will die before dawn. The experience has given me insight into why people are taken victim to these therapies despite any proof of cure (outwith placebo) - when there is little hope, any hope (regardless of what it involves) shines brightly. The addition of acupuncture to a course of advice and exercise for osteoarthritis of the knee delivered by physiotherapists provided no additional improvement in pain scores. Small benefits in pain intensity and unpleasantness were observed in both acupuncture groups, making it unlikely that this was due to acupuncture needling effects. It has been referred to as 'The Endarkenment'. Hundreds of years of people engaging their brain are being turned head-over-heels because of a desire to believe in any self-indulgant made-up Science-Lite™ drivel, which is much more appealing and self-centred than the difficult, complicated, non-personal universe in which we find ourselves. Ben Goldacre in his excellent Bad Science columns has on a number of occasions written about this desire to believe e.g. that fish oil supplements can solve complex social problems such as bad attitude in kids or that vitamin C, so cheap, so good for you, so easily available can cure Aids. The last few days seems to have dressed the media with some really interesting stories regarding complementary and alternative medicine (CAM)- namely homeopathy and acupuncture. Firstly (Strike 1, with 2 more to come later) Tunbridge Wells Homeopathy hospital is to have its NHS funding removed.See BBC link here. Surely good news for all other areas of NHS funding (dare I say it, the more efficacious areas). How could anyone not want homeopathy to be a success? Cheap, safe readily available ingredients (i.e. water and possibly sugar), no side effects, no problems with overdose, no controlled substances. All we need is the evidence that it works, which after many years of wasting resources trying, is why we need put the therapy to bed as a failure. There may well be useful alternative therapies out there, but there isn't a scratch of evidence to show that homeopathy (as opposed to placebo effect) is one of them. Nonetheless, he finished off by saying that "alternative therapies ought to be available where they are wanted and prove cost- and clinically- effective" (my bold), which I guess means he's happy enough for the funding to be withdrawn from Tunbridge Wells as well.